There is no perceptible break in cultural continuity between the beginning and the end of the Anatolian Chalcolithic. However, certain gaps and discontinuities observed in many regions and periods, usually attributed to lack of adequate research, coupled with relevant changes in local cultures, point to a shift of the previous east–west influence to (at least partially) a west–east direction of innovations in certain Anatolian sites (Schoop 2011). In general, this period of the 6th millennium shows thus the existence of wide communication systems, with continuity of previous traditions but with the introduction of foreign decoration techniques. Shortly before 5500 BC, a number of changes can already be seen in the Fikirtepe groups around the Bosporus (mainly settled on its eastern part), which point to a connection with the Vinča culture in the Southern Balkan region. 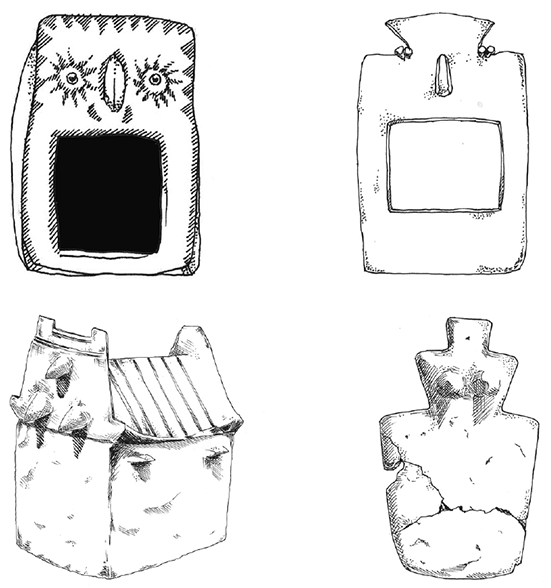 In the Lake District, ‘vinčoid’ pottery is observed postdating the Fikirtepe tradition: it belongs to the dark-faced monochrome group, but there is some decoration with motifs in the stab-and-drag technique. Similar material is found in neighbouring regions (Schoop 2011). During the 5th millennium, in the Middle Chalcolithic, a period of significant cultural development emerges. Near the western coast, Ubaid influence is noticed in urban plans and in pottery typical of the Halaf/Ubaid transitional period. In the Cappadocian margin of the Anatolian Plateau, which showed monochrome pottery decorated with different techniques in the Early Chalcolithic, the site of Gelvery-Güzelyurt shows pottery with swirling designs, executed in a stab-and-drag technique, which represents Balkan influences in the 4th millennium BC (Schoop 2011). To the north, Late Chalcolithic İkiztepe (ca. 4500–4000) shows striking parallels with early to middle 4th millennium BC assemblages from the southern Balkans. This culture shows increasingly strong typological connections with materials further inland. While pottery traits point to continuity of traditions, notable innovations in shapes and decoration point to a koiné that encompasses most of Anatolia, the northern Aegean, and the southern Balkans. This period, since the early 5th millennium BC, coincides with the evidence of the production and consumption of metals, either simple metal artefacts (flat axes, pins, awls) or as crucibles or slag (Schoop 2011). In south-east Anatolia, the Halafian ‘heartland’ developed since the 6th millennium BC, from its previous small or very small communities to large settlements which represented regional centres in a two- or three-tiered settlement hierarchies, with sedentary farming as the main subsistence economy, although cattle maintained its relevance for this originally semi-nomadic culture based on pastoral herding (Özbal 2011). Close contacts and interaction between Halaf and Ubaid from Southern Mesopotamia had already been ongoing for a millennium, and possibly a crisis caused by its demographic and geographical expansion led the culture to a different organisation system. From about 4700 BC, though, Ubaid influence is increased in northern Mesopotamia, across a broad east–west arc (Özbal 2011). Southern Mesopotamian communities seem to have moved northwards, given the sudden social and cultural change in certain sites, first in the northern border, then in the Upper Euphrates. A transformation began which eventually led to the disappearance of the way of life of the Halaf communities: new material culture, with new types of domestic architecture, village arrangements, public buildings, pottery, and other daily life objects; new economy, with less varied and more agriculturally-orientated production system; and a new social structure with sedentary population, a society that ceased to be egalitarian, family and not clan as the basic social unit, and emerging elites. The hybridisation of the two cultures produced innovations that spread in a southern direction, too (Frangipane 2015). Farther south, the Levant Late Chalcolithic shows burial customs, artefacts and motifs with an origin in earlier Neolithic traditions in Anatolia and northern Mesopotamia. Characteristic of this culture are the secondary burials in ossuaries with iconographic and geometric designs. Artistic expressions have been related to northern regions related to finds, ideas, and later religious concepts, such as the gods Inanna and Dumuzu. The knowledge and resources required to produce metallurgical artefacts in the Levant have also been hypothesised to come from the north (Harney et al. 2018). The Chalcolithic in the Caucasus begins with foreign contacts from eastern Anatolia and Mesopotamia through the Taurus Mountains, giving rise to a new social and economic network ranging from the south-eastern Caucasus to the Kuban region in the steppe. The Maikop culture is thus the dominant northern Caucasian tradition, known from its extremely wealthy tomb assemblages, and probably born out of an indigenous group with distant economic connections to the south. The pre-Maikop phase appears in sites like Nal’chik and Meshoko in the late 5th and early 4th millennium BC (Sagona 2017). Characteristic features of the Maikop culture include the adoption of barrow burials, shifting settlements on elevated positions—on foothills overlooking a river valley, but avoiding rugged highlands—with short occupations, abundance of metalwork, and widespread connections with the Near East and Europe. The greatest concentration of settlements occurs in the north-west, around the Kuban River system. The eastern half of the northern Caucasus, judging by the hundreds of Pit-Grave burials, belonged to the steppe cultures. The spread of the Pit-Grave building tradition in pre-Maikop is likely related to the expansion of Khvalynsk settlers into the neighbouring region (see §IV.2.3. Kurgans), but the southern burials—including small, mud-brick burial chambers, possibly reflecting an idealised house—have also been linked to central Asian and northern Iranian influence, which would have been added to the exotic imports of turquoise, silver, gold, carnelian, lapis lazuli, and cotton (Sagona 2017). The southern Caucasus Chalcolithic groups are distinguished from Neolithic cultures by a more flexible lifestyle, reflected in varying modes of occupation (from permanent villages to seasonal camps, from open plains to caves); a capacity to benefit from resources across a wide range of environmental zones, including at higher altitudes; diverse subsistence strategies, incorporating wine-making; external networks, based on a flow of commodities; and advancement of metallurgy (Sagona 2017). The Chaff-Faced Ware horizon forms part of a tradition that reached from the north Syrian and Mesopotamian plains through the middle part of the Araxes Valley and Azerbaijan to north-western Iran, known in the Fertile Crescent as Amuq F. It is found in the first half of the 4th millennium, with Azerbaijan showing slightly earlier dates. This is a homogeneous culture that reflects standardisation and technological simplification. In the later periods of the culture (as well as in north-west Iran), the influence of the Ubaid tradition of Upper Mesopotamia can be seen in ornamentation (Sagona 2017). Connections with the Neolithic, evident in the earlier period with circular dwellings furnished with a central hearth, disappear later on (after ca. 4300 BC) as small, multi-roomed rectangular structures appear, with an evolving social structure, heavy exploitation of tree fruits, and more complex wine production industry. Single or multiple pit–graves with barrow burials are the standard, with the deceased in a flexed position with no preference as to side, showing the start of the ‘sacrificial’ metals in assemblages, possibly to strengthen the kinship-related social status (Sagona 2017). The Sioni horizon is a local, imprecisely defined culture based on ceramics found in south-eastern Caucasus and on the Iranian side of the middle Araxes Valley, as well as in easternmost Anatolia. Its early phase is dated ca. 4800–4000 BC, and its late stage ca. 4000–3200 BC. Sites are characterised by flat settlements with variable building tradition. It probably emerged as local communities moved away from the alluvial plain into the foothills, as they were able to exploit a wider range of resources and pastures. Pottery has relatively few forms and a limited range of ornamentation, and their lithic technology is difficult to reconstruct (Sagona 2017). Chalcolithic peoples from Hajji Firuz in north-western Iran (ca. 6000–5700 BC) and from Seh Gabi in eastern Iran (ca. 4800–3800 BC) can be modelled as a mixture of western Iran Neolithic with significant contributions from a CHG-like population (ca. 63%) and the Levant (ca. 20%), becoming thus more ‘western’, consistent with their shift in the PCA. In Anatolia, the low genetic diversity of early Middle Eastern farmers during the early Neolithic was broken by a wave of ‘eastern’ ancestry from Iran Chalcolithic (ca. 33%), which eventually reached south-eastern Europe before at least ca. 3800 BC. These migrants brought also J-M304 lineages—typical of Caucasus and eastern Iranian populations—to the late Neolithic central and western Anatolia (Lazaridis et al. 2016; Kilinc et al. 2016). This ‘eastern’ ancestry may have been caused by interactions between central Anatolia and the Fertile Crescent in the late Pre-Pottery Neolithic B (Özdoğan 2008), a migration related to other interregional exchanges, or admixture among local populations. The Tepecik-Çiftlik site’s presumed role as an obsidian hub, and its cultural links with the Levant, might have started already before the Pottery Neolithic (Kilinc et al. 2016). Although traditionally associated with an east–west movement of peoples, it could well represent the opposite direction, thus including expanding Anatolian-speaking peoples through northern Anatolia, from the west to the central part. Later samples from Bronze Age south-western Anatolia (ca. 2800–1800 BC) show this ‘eastern’ contribution of CHG-related ancestry, but lacking steppe-related EHG and WHG ancestry (Lazaridis et al. 2016). The Chalcolithic population from Areni in modern Armenia (ca. 4350–3500 BC) also shows similar components to neighbouring Anatolian and Iranian Chalcolithic samples, but with a different distribution: Anatolia Neolithic (ca. 52%), Iran Neolithic (ca. 30%) and EHG (c. 18%). This, coupled with the different haplogroup found, L1a1-M27 (formed ca. 15000 BC, TMRCA ca. 6100 BC), points to a different population in the southern Caucasus Piedmont (Lazaridis et al. 2016). The appearance of mtDNA hg. H2a1 and U4a (more typical of the Pontic–Caspian steppes) among these samples, and the presence of likely early Sredni Stog-related ancestry speaks in favour of female exogamy. Before the emergence of the classical Maikop culture, the three sampled Caucasus Eneolithic individuals of Darkveti-Meshoko from Unakozovskaya, in the north-west Caucasus Piedmont (ca. 4600–4300 BC), present a genetic profile similar to Iranian Chalcolithic samples, with predominant haplogroup J2a-M410, possibly both J2a1a1a2b2a3b1a-Y11200 (formed ca. 5900 BC, TMRCA ca. 5800 BC). This increased assimilation of Chalcolithic individuals from Iran, Anatolia, and Armenia is in accordance with the Neolithisation of the Caucasus, which started in the floodplains of the great rivers of the southern Caucasus in the 6th millennium BC, from where it spread to the western and north-western Caucasus during the 5th millennium BC (Wang et al. 2019). Haplogroup J2a2-L581 (formed ca. 14100 BC, TMRCA 13100) also appears in one sample from Seh Gabi (ca. 4700 BC), and hg. J2b-M12 in two samples from Hajji Firuz (ca. 6050–5850 BC), with hg. G2a1a-Z6553 (ca. 5750) and G1a1b-GG313 (ca. 3900 BC) in Seh Gabi pointing to a mixture of these haplogroups since the sampled Iran Neolithic individuals, compatible with a migration wave of J2a2-L581 lineages connecting the northern and southern Caucasus regions ca. 5500–4500 BC (Wang et al. 2019). This haplogroup is also found later in Anatolian Bronze Age samples and in Old Hittites. Figure 15. Ossuaries from the Peqi’in Cave. Image modified from Jaruf (2017), using figures adapted from Yannai and Porath 2011, and Gal et al. 2011. Samples of the Late Chalcolithic in the southern Levant, from the Peqi’in Cave (ca. 4500–3900 BC), attributed to the Ghassulian period (Figure 15), can be modelled as deriving ancestry from local Levant Neolithic peoples (ca. 57%), Iran Chalcolithic (ca. 26%), and Anatolian Neolithic (ca. 26%), suggesting the spread of Iranian agriculturalists into the Levant. They overlap in the PCA with a cluster containing Neolithic Levantine samples, shifted slightly toward Levant Bronze Age samples. Their prevalent Y-DNA haplogroup, probably in twelve of thirteen samples reported, is T1a1a1b2-CTS2214 (formed ca. 6700 BC, TMRCA ca. 6700 BC), with only one sample of E1b1b1b2-Z830 subclade, also suggesting an important population replacement in the region.